Siquijor is many things at once. It’s the Isla del Fuego (Island of Fire). According to old stories, the island of Siquijor used to be illuminated at night with swarms of fireflies. Another version says this island rose out of the ocean, amidst thunder and lightning, hence the monicker. For those of us who were born in 1990 and earlier, it’s an origin of spine-chilling folklore: it’s home to aswang, mambabarang and traditional faith healers. It is sometimes called the “voodoo island.” Hali doesn’t believe in the mysticism of this province, but I do. The famous mass healer Anthony Vivero, whom I’ve met a couple of times before, testifies to meeting actual aswangs in this province. So does a personal friend of mine, but that’s for another story. 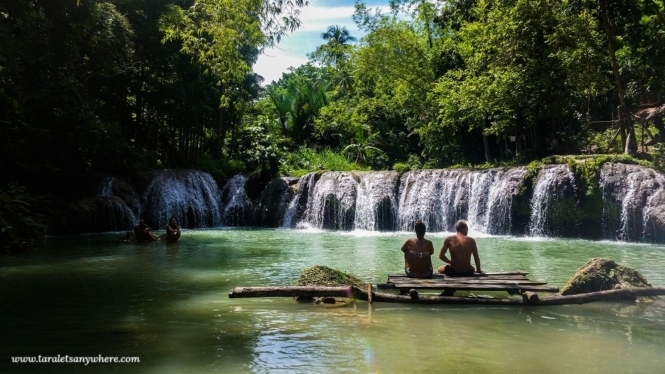 For later generations, Siquijor province is an item to add to a travel bucket list. For foreign tourists, it’s an underrated paradise in the Philippines, with a number of green waterfalls to discover in its mountains. Whatever label is draped across Siquijor, in my imagination it was a mystical province. I wanted to see Siquijor for myself and define it on my own. From Dumaguete, I rode a ferry to Siquijor and chartered a tricycle to take me on an island tour. One of the things I immediately noticed is that it isn’t as uncrowded as is often said. The roads were mostly empty, but the tourist attractions are a different matter, with their own fanfare. The seats surrounding the Enchanted Balete Tree were almost full. In Salagdoong Beach, the famous diving area never got emptied of groups and most of the beach cottages are occupied. This fell on a weekday. In June. That saying, I did see the appeal of Siquijor: its tranquility and nature attractions. It also smelled the way farm provinces do… with a mixed scent of unkempt grass, trees and animals. Of the places I’d visited here, two were favorites. Cambugahay Falls with its jungle-like feel and tarzan swings and Tulapos Marine Sanctuary, a lesser-known gem. I snorkeled in the marine sanctuary and saw a baby shark, sea turtles and the usual diverse variety of fishes and giant clams. Siquijor province seems like a nice place to stay in for a few days, but it wasn’t what I was looking for. It didn’t have the mystery and it didn’t hold me for long. The old magic it seems has faded with time, along with the legends that have become mostly forgotten. The 400-year-old Enchanted Balete Tree is a popular public fish spa. Voodoo dolls and love potions are being sold as souvenirs. A local told me there’s someone there who reads fortune — and I’ve read a few blogs where people visited local healers — but for some reason I didn’t feel the urge to visit them. Love potions, oils and other souvenir. Siquijor is a favorite especially of foreign backpackers because of its remoteness, and ironically this made me feel stuck and isolated. Establishments are far apart. If I wanted to dine in a different eatery than my hostel, I had to walk for 15 minutes on a street without lights. The fact that it is minimally developed, with few public rides, didn’t help. There are almost none in the evening and drivers ask for a premium at daytime. My trike driver for the inland tour kept insisting that I pay him P1250 even though the standard rate is P1000. Halfway through the tour, he started giving me creepy looks. I finally understood why solo female safety guidelines is a common topic. The next day, I flagged another tricycle and was quoted P500 for a round-trip ride to a coffee shop 30-40 minutes away. I haven’t looked at the published rate list but I’m pretty sure that’s overpriced. The tricycle drivers here also do this thing where they wait for you to agree on a fare and then insist on using a habal-habal instead, for the same rate. Habal-habals are less comfortable and actually cheaper. Motorcycles can be rented in Siquijor, and it seems to be the easiest way to explore the island. I’d probably have a better time if I had a driver’s license or at least someone else with me. With regard to its tourist attractions… I feel like Hali would enjoy this place better than I did. He is more into waterfalls and mountain scenery, I long for the light prana of the ocean. The beaches in San Juan in Siquijor are peaceful but swampy, and my feet are itching to dip on the refreshing water of cool-blue beaches instead. Oh yes, these are part of traveling and in its own way I do appreciate Siquijor. I just wasn’t feeling it. Somehow it reminded me of a trip to Samal Island in Davao with friends. Though we did see some nice sights, it wasn’t really a trip I’d look back to. I wanted to relax and give it a chance, but I couldn’t stay put. I gave in and bought a ticket back to Dumaguete on my second day. The trike driver who got me back to the port asked if I refunded the money I already paid in my hostel. I said no, and really I don’t mind. I just need to breathe and relax. Accordingly, Paliton Beach is the best beach in Siquijor. Diving board in Salagdoong Beach. View at Triad coffee shop in Larena. Siquijor used to be infamous for its legends and has always been described as a mystical island. Now it has been rebranded, reinvented. The government of Siquijor wants to transform its image from being an island of black magic to that of a healing destination. But I think the government hasn’t quite got it. 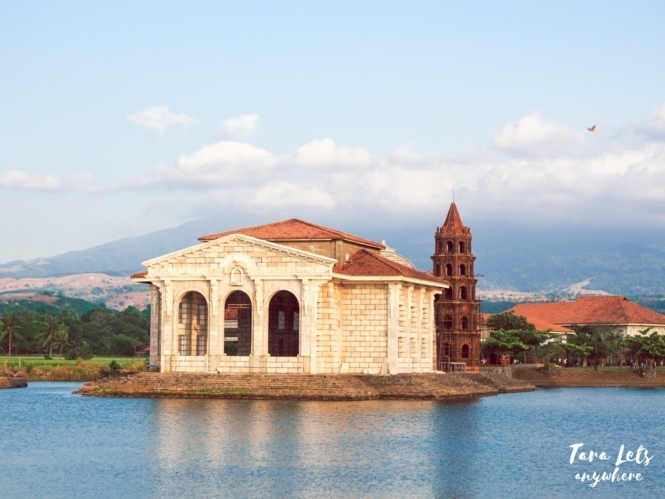 It’s new magic seems to be its allure to those who’re looking for a quieter part of the Philippines, which has numerous beaches and green waterfalls and a certain type of authenticity not found anywhere else in the country. Too bad, it wasn’t for me. Welcome signage near the port of arrival in Siquijor. I felt happier and more relaxed in the coastal city of Dumaguete, with its convenience and extremely friendly people. I felt secure. I could move freely around. There are comforting street lights at night, numerous choices for restaurants and tricycle rides at almost any hour of the day. Did you like Siquijor? Of course you do. 🙂 Tell me about your experience. I’m glad you wrote a very honest review.Most people like to paint a pretty picture and skip the bad details.Also a lot of places around the world are losing their magic, which is quite sad.Anyway the pics of this place are quite stunning! A lot of people like Siquijor so I’m probably in the minority. 🙂 Like I said though I see its appeal, it’s just not for me. Thanks for dropping by! Hi Katherine – Sorry to hear your disappointments and that creepy driver 🙂 There are actually a few more beaches that are not known because nobody is writing about them. Paliton (little boracay they call it) & Kagusuan (rustic) are pretty. Trikes usually are not the best way to go around the island, it’s better to rent a motorcycle if you know how to drive. We hope to see you back. We’ll get you a really delicious halo-halo. Kinda disappointed with Salagdoong Beach Resort. I didn’t know Tulapos Marine Sanctuary and Paliton Beach until I read your blog. I enjoyed Cambugahay though. I was a bit disappointed too. Haha. I was looking forward to seeing the blues and greens of the water, but it wasn’t that vibrant (I had to enhance the photo in the diving board). I guess it’s fun for people who like cliff diving.